The inclusion of Pauline Kael’s 1980 New Yorker review of The Chant of Jimmie Blacksmith in An Australian Film Reader (1) has been credited with rehabilitating the film’s reputation in Australia, prompting Susan Dermody and Elizabeth Jacka to posit that its republication suggested The Chant “may be one of the underestimated and overlooked films of the 1970s” (2). This perception has been further promoted by eminent Australian film scholar, Tom O’Regan, who later contended that it was Kael’s review which was to “salvage the film’s reputation”, which had been, according to him, “attacked from all sides” on release (3), thanks, no doubt, in no small part to his and Moran’s decision to include it in the Reader in the first instance. Yet, somewhat contradictorily, in the very year in which Dermody and Jacka submitted their review of the Reader, they also declared that “[i]n spite of [The Chant’s] critical success, the film failed commercially” (4). For his part, David Stratton, in a short but representative review of The Chant’s critical reception, initially observed that the “reviews were excellent, at least in Sydney” (5). Yet, only three years later, Stratton would declare that there was “a disappointing critical and public reaction” to the film. (6) So where does the truth of The Chant’s initial critical reception in Australia lie? While its disappointing box-office performance is beyond question, does the notion that Kael’s review was needed to “salvage” the film in the eyes of Australian critics stand up to renewed scrutiny? The Chant of Jimmie Blacksmith, the second feature film of Fred Schepisi, an openly ambitious and confident Australian director (7), was at the time of its release the biggest budget film made in Australia at $1.2m. It constituted part of the rejuvenated Australian cinema, the so-called New Wave, financed by the Australian Film Commission (AFC), and followed on the heels of, among others, Picnic at Hanging Rock (Peter Weir, 1975), Sunday Too Far Away (Ken Hannam, 1975) and Schepisi’s first feature, The Devil’s Playground (1975), all finally demonstrating that Australia cinema too could produce ‘quality’ features. The Chant also gained entry into Official Competition at Cannes in 1978, although, despite being a nominated favourite, the film would not win the Palme d’Or. The Chant’s invitation into Competition was widely celebrated in the Australian press, and its Competition interests at the Festival served by an international PR firm. (8) Its selection and nomination was also later emphasised in the lead-up to its Australian release, in order to garner it “cultural estime […] and public relations value” (9). The standing ovation the film received – although commonplace for films in Competition at Cannes – was also broadly reported, most notably and dramatically by Geraldine Pascall in The Australian (29 May 1978), whose opinion was irredeemably compromised, in the estimations of Aboriginal activist/actor Gary Foley, through being the recipient of an “all-expenses paid” AFC junket (10). Perhaps unsurprisingly, Pascall duly delivered an exceedingly positive review of the film, enthusing: The Chant “is not only the best Australian movie made so far, it is, more importantly, a magnificent, daring and powerful one”. High praise indeed! The Chant’s pre-release promotion would prompt Bill Collins (The Sun, 22 June 1978), among others, to describe the film in his review as “perhaps the most eagerly awaited and best publicised Australian movie ever made”. Publicity extended to the production and screening of an ABC documentary on the making of the film – not such commonplace practice at the time – which, while derided as “blatant” publicity (11), was nonetheless extensively covered in the press. The film was unexpectedly kept in the news for a further three weeks when the Theatrical and Amusement Employees’ Association initially banned its exhibition (in Melbourne and Sydney) over the use of foreign, non-unionised crew members. (12) Although this did temporarily threaten its inclusion in the AFI Awards, its participation at Cannes and its overseas release, it also coincided, conveniently at least in one respect, with planned publicity for the film. The production also actively engaged in star-making activities for its Aboriginal stars, primarily Tommy Lewis (who played Jimmie Blacksmith), in a series of newspaper and magazine interviews and profiles. These variously detailed Schepisi’s discovery of Lewis in an airport, and highlighted Lewis’ unchanged, unaffected nature, his positive screen tests with female audiences and even comparisons to a young Marlon Brando (The Bulletin, 30 May 1978). However, interestingly, while Lewis was often commended in local reviews of the film, it was the performance of Freddie Reynolds, as Jimmie’s full-blood brother, Mort, which later earned the greater, unequivocal acclaim of critics. The film’s promotional blitz culminated in what Ivan Hutchinson (Scene, 1 July 1978) described as a “special Hollywood-type” world premiere in Melbourne “on a scale unprecedented for an Australian movie”. Given this heightened environment, it was perhaps not surprising that, with the advance publicity and the many excited observers and supporters of the still infant Australian film industry, expectations had reached a point where critics all but demanded The Chant to be “the greatest Australian film ever made” (13), not only a film but a “cultural event” (Collins, The Sun, 22 June 1978). However, in hindsight, it appears that all of the hype and promotion would eventually play no small part in shaping The Chant’s domestic critical reception, and perhaps even contribute to its disappointing box-office performance; it would be, as P. P. McGuinness posited (National Review, 1978), “counter-productive” (although, admittedly, not for the reason he nominated: the provincial, “Australian tendency to knock the home-grown product”). The film’s critical reception was ultimately a hostage-victim of its own hype (14), with numerous Australian critics explicitly reviewing the film in light of its unexampled (over-)promotion. Collins (The Sun, 22 June 1978), for example, openly expressed disappointment with the film that, despite some having “outstanding virtues”, failed to meet the movie and cultural expectations that he had “been encouraged to believe”. The unreal expectations created by the film’s publicity machine were marvelled at, but in the end felt to be “unrealised”. Far from needing ‘salvaging’, half the Australian reviewers – including McGuinness (National Review, 1978), Brian McFarlane (Cinema Papers, August 1978) and Colin Bennett (The Age, 21 June 1978) – offered avowedly positive critiques of the film. Keith Connolly (The Herald, 24 June 1978) also described The Chant as “a good, thoroughly worthy film” – albeit “less than a great one” – “one that all Australians should see” as, in Bennett’s view, “either […] an eye-opener or a reminder”. In fact, only two domestic reviews, Collins (The Sun, 22 June 1978) and Bruce Wilson (The Sun, 21 June 1978), offered overall negative critiques of the film, with Collins explicitly reviewing it against his own admittedly great expectations. Thus, in short, the greater attention occasionally paid to the film’s failings over its merits and achievements, as well as the openly admitted “disappointment” – however slight or partial – of some critics, does indicate that critical expectations engendered by the film’s promotion, premiere and presence at Cannes were indeed inflated, unduly ‘colouring’ some reviews. As Hutchinson (Scene, 1 July 1978) acknowledged in his review, “Jimmie had a lot to live up to […] it’s not quite the film’s fault that it didn’t altogether live up to those expectations”. 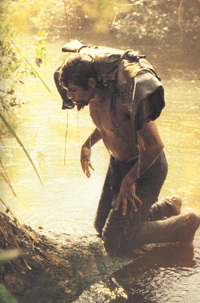 A number of domestic reviewers praised The Chant as being less nostalgic than previous Australian films of the New Wave and for its brave address of an important, “tragic and very timely story” (Hutchinson, Scene, 1 July 1978). The majority of reviewers applauded the film’s examination of “racism and collective guilt” as it “ferociously confronts” Australia’s historical treatment of Aborigines (Bennett, The Age, 21 June 1978). Jim Oram (Daily Mirror, 27 June 1978) even wondered whether the “deep and uncomfortable silence” which accompanied the rolling of the credits at The Chant’s premiere represented the “silence of guilt”, or of “emotions drained by a movie so powerful”. Its contemporary resonance and significance was also highlighted in other reviews, with Bennett praising the film for daring to “turn its attention to subjects relevant to the 1970s”, with Connolly (The Herald, 24 June 1978) concurring, “the questions raised […] still with us” and “coming uncomfortably close to our own” era. However, while much attention was paid to the film’s exposition of white Australia’s historical maltreatment of Aborigines, the ironies surrounding Federation, Australia’s participation in the mother country’s Boer War and the (continued) plight of Aborigines were less often mentioned in local reviews, with the notable exceptions of Bennett, Connolly and Sandra Hall (The Bulletin, 4 July 1978). As Hall observed, Schepisi shows Jimmie as all too aware that, despite the “rhetoric in the air […] and vague promises of better […] times ahead”, “blacks like him will share in none of Federation’s reforms”. A few reviewers, in what was no doubt an attempt to encourage readers to see the film, even attempted to draw parallels between the (perceived) universal and timeless themes it addresses, including a respected critic, Hutchison (Scene, 1 July 1978), and Pascall (The Australian, 29 May 1978), although Hutchison’s misguided rather than malicious downplaying of the centrality of race in the film – it “applies to people of all colors (sic) and races who crush the weak” – can make for somewhat discomfiting (contemporary) reading. Following the shock of the (climactic but) mid-picture massacre, The Chant’s second half was considered weak – or at least weaker – by a number of local critics, even those holding an overall positive view of the film and Schepisi’s handling of the massacre (18): “everything that follows is anti-climactic” (Hindle, National Review, 1 July 1978). As Hall (The Bulletin, 4 July 1978) contended, “he handles the blood-letting with care […] but then the script goes loose” when, as McFarlane (Cinema Papers, August 1978) added, “with dull obviousness, [he] uses the screen as a platform”. It is this editorialising and moralising – particularly in the characters of the teacher and the (almost obscenely) inquisitive butcher-shop customer – where the chief criticism of the film lay, with a number of reviewers considering the second half heavily handled, “obtrusive and unnecessary” (Pascall, The Australian, 29 May 1978) for marking Schepisi’s position. In the end, McFarlane, among others, argued that Schepisi “suffers from overstating his theme” and the Sun Herald (25 June 1978) that he “sometimes tries too hard to makes [his] points”. An oft-noted feature of Australian cinema is its utilisation of the landscape “as a character” (19) and The Chant is no exception. As Allan James Thomas and Adam Bingham note, Jimmie’s relation to the landscape changes over the course of the film. (20) Initially, he is given “an indigenous identity […] positioned within or as part of the landscape” before his attempts to fence off and own the land “take the form of ‘mastering’” the landscape, common to the white man’s relation to the land. (21) However, following the Newby massacre, an on-the-run Jimmie unsuccessfully attempts to use both the fences he built and the land he has become dislocated from, evidence that, as McFarlane (Cinema Papers, August 1978) noted, The Chant is “essentially the story of a man adrift from both societies”. Yet, in offering such an indigenous identification, Schepisi also propounds the ever-used, essentialist myth of the Aborigine’s connection with the land. Moreover, given the vast, “alien-ness and horror” (22) of the land, white Australians are, if not justified, certainly understood in their desire to not only tame and control the land, but those that are ‘identified’ with it. However, while all reviewers wrote glowingly of the film’s cinematography – “stunningly shot” (Bennett, The Age, 21 June 1978) and “superbly captured […] by predictably fine photography” (Jennings, The Advertiser, 11 August 1978) – only McFarlane and Hall (The Bulletin, 4 July 1978) particularly noted its symbolic connection of the landscape with Jimmie’s character. The Chant of Jimmie Blacksmith’s critical reception in Australia was indeed negatively influenced, by admission of numerous local critics, by unreal and inflated expectations, a direct consequence of the then unprecedented (over-)promotion of the film. Nevertheless, the great majority of critics considered the film to be, while demanding and in spite of its flaws, not only emblematic of the maturing Australian film industry but a rewarding experience and a very good (if not great), significant film. Certainly, numerous reviewers did contend that The Chant’s narrative structure was somewhat unbalanced, pronouncing the film’s (climactic) mid-picture massacre to be under-defined by the degradations and humiliations suffered by Jimmie, and also that Schepisi was guilty of editorialising and moralising in the film’s second half. However, that said, the majority of local critics considered the depicted violence to be “brilliantly” and skilfully handled, and the film to be powerful and beautifully shot. In conclusion, the film’s critical reception in Australia was markedly better than one in which the inclusion – and New York-critic ‘stamp of approval’ – of Kael’s review of The Chant in An Australian Film Reader could ever be required to “salvage” its reputation. The Chant of Jimmie Blacksmith never required Kael’s – or, for that matter, O’Regan’s – rehabilitating, yet it seems that the history of the film’s critical reception in Australia most certainly did – and does. The below list of Australian reviews, while not exhaustive, is considered representative. Colin Bennett, “This Blacksmith Hammers Home the Guilt of Whites”, The Age, 21 June 1978. Bill Collins, “Chant Out of Tune”, The Sun, 22 June 1978. Keith Connolly, “The Chant of Hate and Hypocrisy”, The Herald, 24 June 1978. Peter Coster, “Chant of Death”, The Herald, 20 June 1978. Martha Du Bose, “Schepisi’s Chant is the New Standard”, The Sydney Morning Herald, 22 June 1978, p. 8. Sandra Hall, “Blacksmith’s Hammer Too Heavy”, The Bulletin, 4 July 1978. John Hindle, “The Chant of Jimmie Blacksmith”, National Review, 1 July 1978, pp. 20-1. Ivan Hutchison, “Jimmie Just Falls Short”, Scene, 1 July 1978. Terry Jennings, “‘Jimmie’ Tears Away the Gauze of Guilt”, The Advertiser, 11 August 1978, p. 26. Dougal MacDonald, “‘Chant’ Leaves a Sobering Taste”, Canberra Times, 14 September 1978, p. 17. P. P. McGuinness, “Schepisi Proves a Point”, National Review, 1978. Brian McFarlane, “The Chant of Jimmie Blacksmith”, Cinema Papers, No. 17, August 1978, pp. 58-9. Jim Oram, “Silence is Great Applause”, Daily Mirror, 27 June 1978. Geraldine Pascall, “The Chant of Success”, The Australian, 29 May 1978. Bruce Wilson, “When the Chant is Ended, the Violence Lingers On”, The Sun, 21 June 1978, p. 8. “The Chant of Jimmie Blacksmith”, Sun Herald, 25 June 1978. Pauline Kael, “A Dreamlike Requiem Mass for a Nation’s Lost Honour”, in New Yorker, 15 September 1980, from Albert Moran and Tom O’Regan (Eds), An Australian Film Reader (Sydney: Currency Press, 1985), pp. 204-10. Susan Dermody and Elizabeth Jacka, “An Australian Film Reader in Question”, Continuum: The Australian Journal of Media & Culture, Vol. 1, No. 1, 1987, p. 148. Tom O’Regan, “A National Cinema”, Australian National Cinema (London and New York: Routledge, 1996), p. 59. Susan Dermody and Liz Jacka, The Screening of Australia: Anatomy of a Film and Industry (Vol. 1) (Sydney: Currency Press, 1987), p. 116. David Stratton, “In a Hostile World”, The Last New Wave: The Australian Film Revival (Sydney: Angus & Robertson Publishers, 1980), pp. 135-8. David Stratton, The Avocado Plantation: Boom & Bust in the Australian Film Industry (Sydney: Pan Macmillan Publishers, 1990), p. 59. John Jost, “The Money Game Behind the Making of a Film”, The National Times, 24 June 1978, pp. 20-1. John Hughes, “Jimmie Blacksmith … A Star is Shorn”, National Review, 1-7 September 1978, pp. 21-3. Daily Mirror, 4 May 1978. “Union ‘blacks’ $1.2m Aust film”, The Sydney Morning Herald, 18 April 1978. Robert Drewe, “Inside The World of Jimmie Blacksmith”, The Bulletin, 30 May 1978, pp. 51-6. This view is supported by Stratton, “In a Hostile World”, pp. 135-6. See also Martha Du Bose, The Sydney Morning Herald, 22 June 1978. For further condemnation of the lack of indigenous input in The Chant of Jimmie Blacksmith, see Anne Hutton, “Black Australia & Film: Only if it makes money”, in Moran and O’Regan, p. 335. Interestingly, Schepisi was to cut 16 minutes from the film’s second half of the film for its international release; from Stratton, “In a Hostile World”, p. 137. Allan James Thomas, “The Chant of Jimmie Blacksmith”, Senses of Cinema (2000), accessed 6 April 2005; Adam Bingham, “A Cry in the Dark: The Chant of Jimmie Blacksmith and the ‘New Australian Cinema’”, Senses of Cinema (2005), accessed 15 April 2005. “Two Aussie Films Praised: English, U.S. Critics Rave”, Daily Telegraph, 24 February 1979. Australian Film Commission, “Australian Feature Films with Ratings Over 20 on Sydney and Melbourne Television, 1980–2003”, Australian Film Commission (2004), accessed 16 April 2005.